Cleopatra Plus is one of the amazing games by International Game Technology, also referred to as IGT. IGT knows how to keep its players entertained and satisfied. This is why it releases new games on a regular basis. This includes this wonderful Ancient Egyptian themed game, Cleopatra Plus. As the title of the game implies, the game is about one of the greatest Queens in the history of Egypt and the world, Cleopatra. It is also the sequel to one of the most successful games by IGT, Cleopatra. 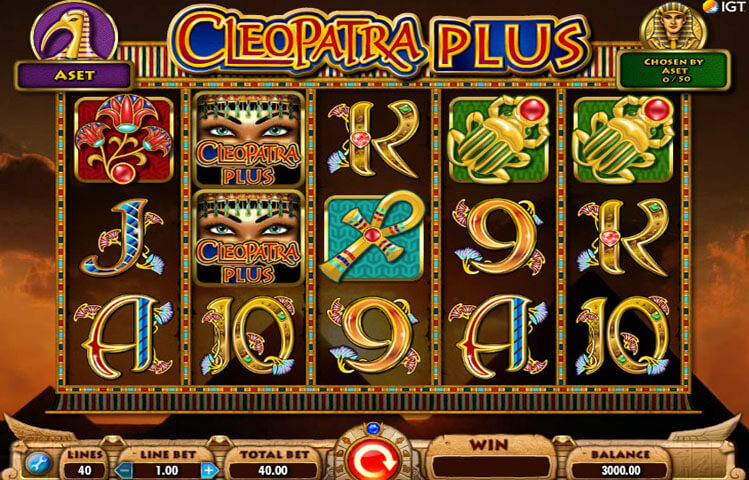 Cleopatra Plus is one of the newest games by IGT. The game takes players on an ancient Egyptian themed ride. They will dive into Ancient Egypt as they travel back to the reign of Queen Cleopatra. This is why, from the moment open the game, they will see that the visuals depict the theme. This is because all of the visuals are inspired by the Ancient Egyptian theme of the game, and Queen Cleopatra. Therefore, players better be ready to travel to Ancient Egypt. They will not only do that for the great experience and the adventure, as they will also be able to claim their share of Cleopatra’s fortunes. The game play of slot is pretty easy. This is because players will find the control panel underneath the spinning reels. Through this panel, players can do everything they need to control the game play. This includes placing the wagers, spinning the reels, viewing the prizes and more. The game’s visual are captivating and immersive, which is not really a surprise. This is because the game is from the amazing portfolio of IGT. The visuals manage to depict the theme of the game perfectly. They include Queen Cleopatra herself, the main character of the game. The other symbols include a golden scarab, a golden artifact, the ancient Egyptian red flower, a golden ankh, multiple Egyptian gods and poker card icons. Even the sounds that players will hear in the background as they spin the reels are affected by the theme. Therefore, players would get to enjoy a highly engaging experience whenever they give the game a few spins. The best part is that the game can be played right here for free. This way, players can get to see what the game has to offer before they start placing real bets. The Cleopatra symbol is the wild. This means that it can substitute for all other icons on the reels to help players form a winning combo. It will not replace the golden pharaoh and queen symbols. All wins created with the help of the wild are going to be doubled. The game also has a free spins round that is activated with combination of the Golden Pharaoh and his queens. They also give a number of Followers that can be used in the Bonus Map Feature.